The Skinny: Fluffy fun, with the emphasis on fun. 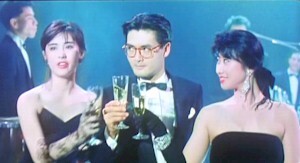 Chow Yun-Fat is a riot. by Kozo: Abominably silly comedy from Tsui Hark’s Film Workshop casts Chow Yun-Fat in one of his most challenging roles: a bigamist who must somehow earn the audience’s sympathy. Amazingly he does it. The problem for Chow Ting-Fat (Chow) is that he loves both women equally and cannot say no to either as both bring the proposal of marriage to him. Wife number one is Joey Wong, a boutique owner who loses Ah Fat when he goes to take care of the European stock market. Wife number two is Sally Yeh, a stewardess who loses Ah Fat when he goes to see to the American stock market. Ah Fat juggles his sweethearts with the help of pal Chi-Hung (Waise Lee). How anyone could find hilarity in bigamy is beyond me, but eighties HK Cinema found a way. The comedy in this film is an absolute cringe-fest (think Three's Company on speed), but it is frequently funny despite tacky musical numbers and overdone acting. Strangely, one can see what made audiences flock to the theaters for these eighties screwball comedies. The situations and jokes fly fast and furious, Chow gives a game comedic performance, and the female leads are charming.